May 11, 2019! I will be presenting at the Abigail Adams Chapter of the Daughters of the American Revolution. 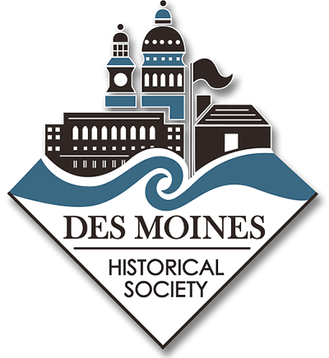 I will be emphasizing the many Ankeny women who were early DAR members within the Abigail Adams Chapter of Des Moines. Harriet Louise Ankeny was a delegate from the chapter to the DAR Continental Congress in Washington, D.C.! On Saturday, November 10, 2018, I will be at the Waverly, Iowa Public Library and will be part of a very large contingent of Iowa authors talking and hawking books! I'll have to be creative to get lookers attention. I've used candy, posters, computer slide show and a friendly smile. I may have to set bear traps this time. September 15th was a full day of book selling, story telling and seeing old friends and making new friends! Beautiful venue at Capital Square in downtown Des Moines. Thank you Iowa Author Fest organizers for making this event happen each and every year. See you next year! Participated in the annual Iowa Author Book Fair at Otter Creek Country Club from 9 to 12. Pouring down rain, snow, sleet, hail and snow thunder. But that did not keep me away from sharing the stories about the Ankeny family and showing a new supply of photos to history buffs. I totally loved sharing my book writing experiences and Ankeny family history with my Jean Marie Cardinell Chapter of the Daughters of the American Revolution. Along with the Ankeny family stories -- on this day I highlighted the MANY Ankeny women who were DAR members -- including Delegates to Continental Congress and Chapter Regents. I read three excerpts from Chapter 9 -- The Civil War Years -- that demonstrated the deep love and devotion within the Ankeny family. 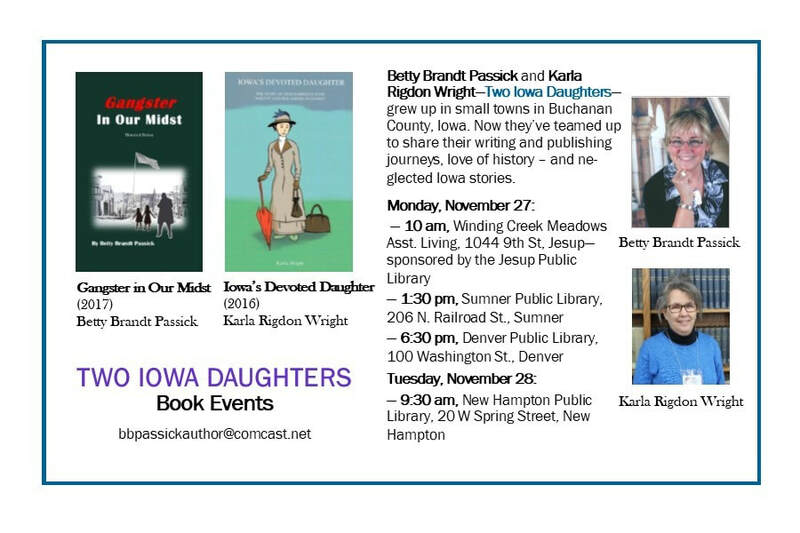 ​Was invited to the Kirkendall Library to discuss my book "Iowa's Devoted Daughter" and to share the history of the Ankeny family to the Ankeny, Iowa community. It was a great evening, with an interested, attentive and large audience. Answered many questions and was especially happy to have my cousin, Jan, join me. Hope to repeat this "talk" soon to more history lovers and new lovers of "Iowa's Devoted Daughter". Visited with history and genealogy lovers during our two day - four town whirlwind library book tour. presented our historical fiction books at libraries and venues in Iowa. and now find ourselves writing historical fiction books. Please check out Betty's latest book, "Gangster In Our Midst". It's a great read! I was at Plot Twist Bookstore in Ankeny, Iowa all afternoon from 1:00 to 4:00 signing books and jawing about the remarkable Ankeny family to anyone who would listen on a gorgeous fall afternoon. On October 14, 2017 I participated in the Des Moines Historical Society local artists and history event at the Iowa Genealogical Society, 628 East Grand, Des Moines, which is just across the street from the Iowa Historical Museum. Interestingly enough, it was just down the street at 824 East Grand where John Fletcher and Sally Ankeny built their home. That home was then lived in by their daughters Florence Russell and also Mary Bird Israel. The Wallace Agriculture Building now sits where the Ankeny family once lived. It was raining and thundering outside but we had a great group inside, high and dry, and noisy too! Sold five books to interested Des Moines history buffs. Bought a cool T-shirt to support the Des Moines Historical Society. I was at the Iowa Author Fest at Jasper Winery in Des Moines, Iowa, on September 23, 2017. Sparse crowd on a warm weekend. Although I did not sell any books myself, I did meet two Iowa authors who are now friends! Linda McCann and Jan Walters. Linda writes historical books for the publisher The Iowan Books. I purchased "Lost Blackhawk County" -- one of many books Linda has written. Jan writes historical fiction and her latest book is Red Sunset Drive: A Ghost and Cop Series. Thank you Leo Landis, Curator, State of Iowa Archives and Historical Museum, for allowing us to borrow the shoes and parasol from the Iowa Museum Archives. They were used by the Ankeny women back in 1890! Very special! Thank you Rosemary Taylor, Museum Director, for all you do for promoting Miss Harriet Louise Ankeny!!! Presented at the Ankeny Area Historical Society museum. Met four wonderful ladies who are descendants of Henry Giese Ankeny. Had a great chat with them. ​Presented Ankeny family program — emphasizing the founders of Ankeny, Iowa to the Ankeny Genealogy Chapter at the Kirkendall Library in Ankeny, Iowa — it was a good night! 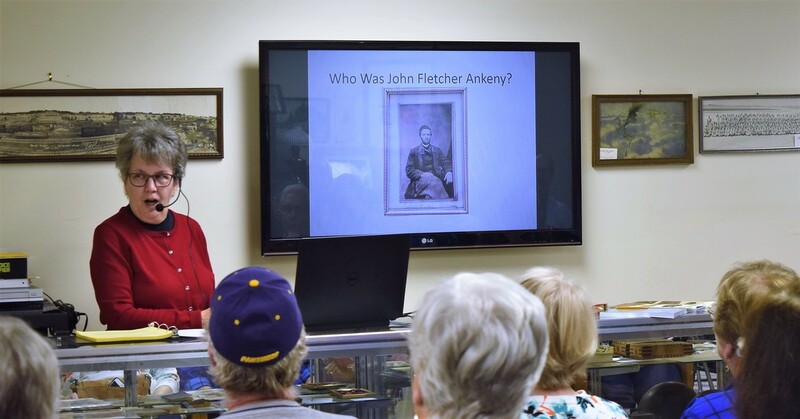 ​Presented information about the Ankeny family and their contributions to Ankeny and Des Moines, Iowa at the Ankeny Area Historical Society Museum in Ankeny, Iowa. Four descendants of John Fletcher Ankeny attended. It was a wonderful day!